Magic was the word for it. Jim and I had never expected to discover our "one particular harbor" the first time out. Yet, we did. And we knew it. Jimmy Buffett penned the sentiment. The words were familiar enough for me to recognize the emotion contained in his lyrics within days of our settling into Lucayan Marina Village. As the lyrics and melody spun in my head day after golden day, I needed to utter a sentiment of my own. Words inspired enough to capture these moments but no words came. Instead, I could only walk the grounds wide-eyed as its landscape unfolded before me. Tropical splendor stood only a dock's length away. Tall palms heavy with coconuts swayed in the soft breezes. The Damn Yankee lay in her slip upon a fluid sheet of translucent aqua. I swallowed around the tightness in my throat at least once a day in the beginning. The setting alone of Lucayan Marina Village remains a powerful wonder. A sense of incredulity filled me every morning to wake to a sky lit like the inside of a polished shell. I was quite satisfied at the way things were going. Feeling so comfortable so quickly, it was amazing to realize the States lay across the Gulf behind us. Even more amazing to accept that Jim and I had arrived, through our own efforts, to spend the upcoming winter in another country. The Bahamas. The encircling harbor Jim chose looked much as I had imagined many years and dreams ago. I still searched for the right words when the thought occurred that the Damn Yankee had become that sailboat inevitably pictured in postcards surrounded by crystal water and towering palm trees. I smiled. Spectacular! It's the brightness of the colors that registers first. I stare at an ocean of turquoise water and the varied green of foliage but the image feels vaporous as though the scene could disappear if I blink. I am living in sensual overload. The days drift by. The charm remained. No mystery to me finding myself re-living our arrival over and over wanting to re-capture my initial feeling of pulsing excitement and spirit-stirring awe. These first days upon reaching the Bahamas were mine to revel in. I would put the scenes in context later. Then I could separate the visual from emotion. True, I was in a state of luxurious relief at reaching landfall. Yet, what I felt welled from somewhere deeper. There persisted the warmth of coming home in a place I'd never been before. How could that be? Since an answer eluded me, I let the scene continue to play out one more time. Nestled to the right upon entering Bell Channel within a gentle curve of shore front lay a string of attached villas beckoning for a closer look. I saw docks stretched out into the harbor like spokes on a wheel. Sailing sloops and powerboats bobbed nods of greeting as they lifted on gentle wavelets. Just beyond, Lucayan Marina Village made some picture. To me instantly recognizable, I had marveled over the same tableau spread across the glossy pages of Cruising World or Sail magazines depicting harbors in the Mediterranean. Had we found the makings of a Bahamian Riviera in miniature? I hoped so. I could deal with that. I remember craning my neck, squinting to focus through sunlight strong enough to shoot glittering sparks of light flashing off the water. Closer, the villas dazzled. Deftly creative, clever in concept, they evoke timeless permanency. Style and substance kissed with the whim of fancy sit under drifting puffs of white clouds. Weeks later, my feelings are still impossible to define. It's a heart thing. At once was the sure knowledge that this harbor held not only refuge from the sea but also the entrée into Jim's and my new life. Within its curving banks we'd lay the bedrock for whatever is to come together. I thought, our children, Jimmy and Erin would not believe this was real. In those first moments, I wanted them to see what I was seeing. I wanted them with us now. Impossible. Tears pricked though I couldn't stop grinning at the sight. And when I blinked, the scene remained. No longer vaporous, it now stood solidified in limestone and sand as we glided closer. Intent on not missing a thing, I recall following the stretch of breakwater as we motored beyond the fuel dock alone with my thoughts. They tumbled free while I absorbed the setting. In an effort to control my excitement I drummed my fingers on the Damn Yankee's coaming until the clattering distracted Jim. He shot me a look I recognized all too well as he swung into the waterway holding our slip. Oops! I jumped up to grab the lines in "boat mode" once again. Lucayan Marina Village extended its welcome by engaging all the senses at once. Flanking one end of the fuel dock, flying high on cross-trees, the marina's two white flags embossed with leaping dolphins whipped in a brisk breeze that lifted my hair while it sang past my ears. The villas sat gilded in sunlight. Washed in gemstone colors of topaz, emerald and ruby, their multi-paned windows winked a welcome while the lush leafiness of bougainvillea toppled beneath in careless profusion. Flowering vines sprawled to twist their way around the villas' ornamented verandahs fenced in precise angles cut in wood or cast in fanciful curlicues of wrought iron. The scents of salt water and hibiscus floated on the air. I stretched over the lifelines, entranced. Even a distance away the scene enticed with a panorama so charming I could easily imagine our living here forever. Lucayan Marina Village does not disappoint. Climate and convenience combine easing away years of pressures surrounding work and home. Each day I soaked in the sights and let the warm air soothe. The Lucayan Marina Village has exactly the right atmosphere to allow two beleaguered urbanites to segue effortlessly into retirement. I can smile now, remembering Jim's seven trips to Lowe's in one day for a plumbing fitting in the midst of our home renovations before the sale of our house. Needless to say, he was not happy. I retreated to our empty kitchen to scrub the floor I'd washed two days earlier. It's a distant memory now, like a root canal or childbirth. Only the twinge remains. Easier to slip into our new routines when the pressing questions of the day are, what's the weather and what's for dinner? We're relaxing. There is a lot to be said for continual sunshine and balmy breezes in a setting like a small paradise. Who knew? 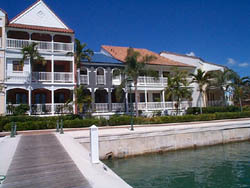 Jim had Lucayan Marina Village in mind since last year. He'd chosen well. 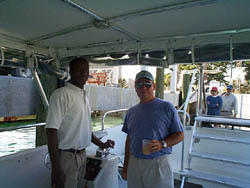 After crossing to Grand Bahama Island with Captain George the previous year, Jim enthused over both setting and staff. He was absolutely right. After over thirty-five years, he knows me too well. Even laundry day became less a chore done in the dappled sunlight shinning through a wall of open windows set in mahogany. Just steps away from our dock, the use of six washers and six dryers filling and spinning while I raided the book exchange or perched to chat beneath the shaded coolness of a small side gallery kept the hamper empty and our selection of clean clothes limitless. The heated pool, arched in white stucco complete with its own spraying fountain loosened our tight muscles while a rousing bout of volleyball kept them taunt. That is, if we refrained from ordering a couple of Kaliks along with our soon to be favorite club sandwiches prepared daily by Cynthia or Patrice and available at the pool bar. To clarify any confusion, the sandwiches as well as Cynthia and Patrice are our favorites. Inside of one month all but the most pressing boat chores were shelved. Setting out the Pawley Island hammock between the mast and forestay was project enough for one day. Jim used the hours that afternoon to try it out, pronouncing it "fine with a perfect swing." He picked up the word manana along with the notion behind it with my enthusiastic support. But old habits lingered. With Kevin and Teresa gone, Jim had second thoughts in the following weeks mainly pertaining to the Damn Yankee's scum line and the use of a stiff brush. Couple that with his immediate need to varnish set me below to hold up my end by scouring the galley and polishing the wood in the saloon. I also dug out the Dirt Devil I'd hoped was lost forever. There would always be boat chores but they became difficult to sustain in such an unparalleled setting. Manana became my mantra. I held my ground. It was time Jim learned as well. I am much more adept at leisure than Jim. Actually, I excel. After over thirty years of my time being dictated by work and home routines, I told myself it was no sin to indulge in the nonessential and the trivial. 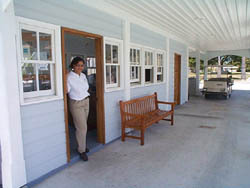 Months into our stay, I continued to walk the grounds at Lucayan Marina Village drop-jawed past the refinement of peaked roofs and jalousie shutters arranged in an easy symmetry to highlight each townhouse's entranceway. I nearly always took the long walk from the pool strolling past the front of the townhouses. When no one was looking, I'd pinch myself. Stone steps lead up onto small porches that decorate and protect from the day's heat. The warmth of brick walkways seeped through the soles of my sandals. Fragrance drifts on the sea air. Each breath here is a joy. Each sight is a gift to treasure. Purple hydrangea bushes vie for space with the lime yellow of croton leaves. Pots made of terra cotta hold flowers of vibrant red set against thick mahogany doors. The windows glint in the sunshine. Care and beauty meld. Gazing quietly, the sharp, crispness of colors glows like a painting worked by the hands of Vincent van Gogh. Here, I'm smiling all the time. Laugh lines be dammed. Bird song echoes from the gnarly limbs of cypress and the plumed branches of palm planted across the curved sweep of manicured grass that extends past the docks to surround the pool. I hum as I walk along. Funny, I never noticed the birds singing in the states. I know they did. I just didn't hear them. Are they louder here in the Bahamas? Maybe I have more time to listen? No need to delve too deep. There answers surround me. 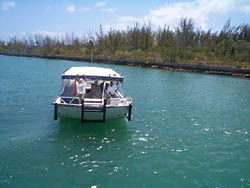 The why and the how preceding the development of Lucayan Marina Village is intensely visual. It lies in the inspiration. It lies in the structures. It lies in the landscaping, and more than anything, it lies in its staff. Down in the Caribbean sunshine…"
How could there be any lack of good times among a retinue of individuals who offer their friendship hand in hand with their hospitality? I lift my arm to answer Aaron's wave as he rolls past, just across the grassy path toward the pool in the marina's golf cart. It's lunchtime. No doubt Aaron is picking up Cynthia or Patrice's delicious luncheon special for his associates in the marina office and the Pelican Bay Hotel across the harbor. I match his smile with my own. Daily rituals, I thought. There's comfort in habits and Aaron's hearty wave included me in his. 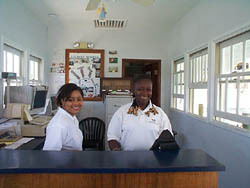 Always, the staff at Lucayan Marina Village includes. I suspect Mr. E. Christiansen's many and varied experiences fueled the idea of what his marina and hotel should be. Those ideas prodded him to act by creating the Lucayan Marina Village and the Pelican Bay Hotel. Mr. C, as he's known, provides the vision. His staff, every one, provides the vitality. They are Mr. C's home team. The advantage remains theirs. 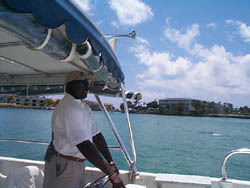 Thomas handles the dock and whatever comes next with easy aplomb as the Lucayan Marina Village's dock master. Smile at the ready he walks the docks, quietly there, diligently attentive that all is as it should be both for the vessels under his care and the individuals aboard them. Minutes spent with Thomas always embellished my day with the glisten of a newly minted coin I could carry around in my pocket to reach for, with me the better for its warmth and weight. Soft-spoken and logical, he wields the winsome charm of a diplomat. I know Mr. Christiansen's vision remains secure in Thomas's steady and capable hands. Somehow, I confused Thomas and Peter for over a month. What does that mean? Talking directly face-to-face those first days, I hesitated. Both about the same height and weight, I remained confused. Even their smiles were similar. I wondered were they different sides of the same coin? No. They were two different men with the same work ethic. That was obvious. I grew to distinguish Peter's fast clip down the dock from Thomas's more deliberate stride. Peter hurried past alert and focused on the matter at hand. Combining decorum with a righteous intensity, Peter's manner reassures. All will be well. Giving the task the solemnity it deserves, he observes, studies, considers then judges before he acts. Whatever the process, his results are consistent. He's got it under control. 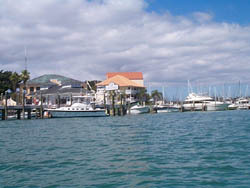 The marina office is the hub. It's where the action is. It's where I can find Tammy, Portia, Rhonda and Tabatha. Any requests? Information needed? Quarters for the laundry or ice for Goombay Smashes, need a magazine, a chart, or a tee shirt? Tammy will happily fill the demand. What Bahamian CD should I buy? Will it be the contemporary Stevie S. or the "storyteller" Phil Stubbs? Maybe I'd prefer the Diva of the Marketplace, Veronica Bishop? I have only to talk to Portia. I want all of them and Portia offers an indisputable rationale for the purchase of all three or more. Is the ferry due back? Does the Pelican Bay have any rooms? Will you make a dinner reservation at the Ferry House? Rhonda is already on it. What time is the fish fry? Tabatha shoots back the answer. Exhibiting unfettered competence, these women know it all and willingly do it all for you. And they fill each request with kindness and a smile. Collectively, they infuse Lucayan Marina Village with its heart. It was Tammy, consummately stylish herself, who complimented me on my braided hair. She especially praised my choice of small pearly shells for accent. Pleased, I touched my fingers to a shell while I admired the silk roses she'd had woven into her own intricate braids. My braids were fun but I had to admit, Tammy looked much better in hers and I told her so. We laughed together in shared agreement. Tammy's smile dazzles. I thought it a fine backdrop for her ebullient personality. Without missing a beat she deflects Aaron's teasing with a penetrating barb of wit. As usual, he chuckles all the way out the door. Rhonda glances up from her computer smiling serenely. Did she hear Tammy and Aaron's exchange or was she dreaming about her new baby due in June? I caught her brief nod. Always calm and innately graceful, she'd heard but was already tapping away at the computer, an even wider smile on her face. Portia was due any minute. I was anxious to see her. She'd be surprised. I had a book for her, Patricia Cornwell's newest hardback. Patricia Cornwell was her favorite. Murder and mayhem was Portia's forte. 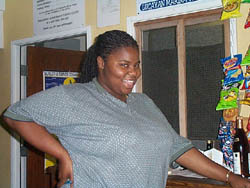 Her male co-workers respected that. Deceptively diminutive, Portia is sharp, smart and funny. She could easily slip into the role of protagonist in her own detective series. Curious and acutely perceptive, Portia and I connected over books and music and men. Upon handing over the book, I was rewarded with her best smile, dimples and all. I knew she'd savor it and enjoy. This was another good day! Back in the office, Aaron voiced a ready quip after checking out the "The Last Precinct's" cover. He towered over Portia eyeing the book for a moment, but appreciating Portia's penchant for homicide, he quickly rephrased his comment and edged around the counter stepping carefully around her. "You better watch you're talking, Aaron," Tammy said as she grabbed her bag and headed out the door not a braid out of place. Our laughter followed her out. As you might have guessed by now, I have a special fondness for Aaron. It's the whole package. He carries himself with all the dignity of a native chief. Handsome, over six feet, he's gracious and earnestly friendly as well as modest and imperturbable. Cheerful and consummately kind are the first words that pop into mind when I think of Aaron. Not the easiest of virtues in practice, Aaron manages both daily with a prescient humor. Hearing his jaunty "Good-morning" as he handed me the daily weather fax and the New York Times pages highlighted my morning. I refused to think about the mornings after we'd gone. How would I do without Aaron's soft tenor and his killer smile? Ferry rides from the marina to the Marketplace became intimate entertainment. The social exchange of words and laughter brought us all closer. Jim and I quickly began to feel like family. 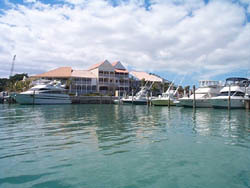 Lucayan Marina Village quickly felt like home. The sun shone. The water glittered and gleamed. Roddy was running us across the harbor. Roddy is the youngest of the staff. Confident behind the wheel of the launch; he exudes vigor and gusto. Possessed of a smile full of a beguiling defiance, I considered him the adventurous pirate with charm to spare or was he the chivalrous buccaneer? No need to ponder for long. Roddy displays both with swashbuckling effect. Cocky with a rakish charm, women don't have a chance. Stepping from the launch, I hear the laugh first and grin as high-pitched notes of jubilant exuberance ring out over the water from the steps of the concrete landing. I know without looking up that I'm hearing the Fabulous Fabian. Offhandedly handsome, even at ease the man fairly vibrates with energy. He bounces on the balls of his feet before he appears to tumble down the steps and onto the launch with an enthusiastic greeting for Jim and I. A clatter of sound hangs in the air over our responses. I catch Jim's eye. We smile knowing smiles. I have never heard laughter like it. Neither has Jim. It tickles. It's infectious. I laugh too but my laugh lacks something. It's not loud enough. It doesn't linger. My chortles will never stop people cold and make them grin. Suddenly, I feel the lack. Maybe Fabian can give me lessons? No. His laughter is his gift dispensed freely. I'm happy to be his recipient as I bask in the deliberate joy shining in his eyes as he laughs again with us. Fabian is a dervish in action. I continue marveling, watching his long legged strides eat up the length of the dock, his nimble fingers at the control of the launch, or grilling for fifty at the Friday fish fries, Fabian is everywhere at once. Does the man ever wind down? I shake my head at the very thought. Never. 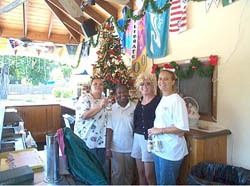 Noreen, Virginia and Yolanda are waving from Yellowtail's, the outside bar at Pelican Bay. I wave back. Three more of Mr. Christiansen's clever staff, how does he manage to find such friendly people? Or do they find him? "How about a quick Kalik before we hit the Marketplace," Jim asks? "Sounds good to me." I take the stone steps two at a time past the bubbling hot tub and head for the nearest bar stool. selfsame care in presentation only enhances the friendly atmosphere, as abundant here at the hotel as at the marina. Towering palms rake the sky. Crimson flowers nod from the vibrant green bushes surrounding the pool and flagstone patio. Guests sun themselves in the abundance of lounge chairs set around the pool. "Good to see you Gwen." Virginia says turning to Jim. "Going to the Marketplace to buy your wife a present?" She teases with a complicit wink at me. "Cruise ships in, there's sales today," Noreen interjects. Yolanda passes two Kaliks over the bar. As comfortable with themselves as with each other, the women stand together bonded by long years of friendship. Noreen began their story during our talks at the marina bar. She never finished. Too busy. I knew they were three girls from the island of Spanish Wells, come to Grand Bahama Island where they've remained. There is a story there, I'm sure. I wonder, what brought them to Lucaya? Why did they stay? I'm anxious to have the blanks filled in. But there's no rush. I'm new. Cultivating friendship takes time; sharing confidences took trust. Meanwhile, I sipped my beer. 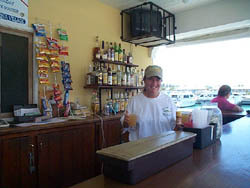 Earlier, Noreen told me that she was moving across the harbor to tend bar at Yellowtail's. I would miss seeing her poolside at the marina. But, ever optimistic, I'd relish the chance to patronize Yellowtail's more often. By June, Noreen would be responsible for the hotel's floating bar as well. I'd miss that. We'd be leaving before then. Floating bar. There is a concept I'm anxious to try. All three women command Yellowtail's with unflappable calm. Noreen brings a cordial charm to the bartender's ritual. No cautious distance to maintain with guests, she listens as conversation swirls around her seeming always to appreciate the company. And she remembers what you drink and your name. There's a moment to talk while she builds your drink or pours your beer. Fair, with her long hair tucked into a ball cap or loose to her shoulders, she presents an airy delicacy. I could see Noreen living in an earlier age as the mistress of her own tropical plantation serving her famed Goombay Smashes to all the planters within miles. All the women have lyrical accents that convey the color, fun and flavor of what life is like for the residents. Noreen, Virginia and Yolanda made it easy for me to slip into that pattern and for a time become part of it. Yolanda presides, animated and friendly offering drinks with a welcoming grin and a wry quip while Virginia holds court behind the bar at Yellowtail's with all the sureness of a benign despot crowned with a wealth of luxuriant red hair. All are contentedly composed whether two guests or twenty are calling their selections. Theirs is an easy way with the guests. When the girls from Spanish Wells are enjoying a day off, I might find either Antonia or Verushka bustling behind the bar readying the variety of fruit juice needed for island drinks with tidy assurance. In the lyric cadence of their native vernacular, both women exhibit a sharp candor and a ready wit. Though I can admire Veruska and Antonia's diligence, their quickness and efficiency, it is their joyful boon of goodness of heart that resonates like the jovial beat of Bahamian drums. It will not be easy to leave Lucayan Marina Village. It will be even more difficult to leave the friends we've made over the last few months for they've shared much with us, as good friends do. We'll return soon. Jim and I have been lucky to have had time to see beyond the beautiful setting to the essence of what holds our hearts and will bring us back time and time again. They have names and faces. And all are safe within." Thank you, Jimmy Buffett for the words. And thank you Mr. Christiansen, for understanding the sentiment enough to construct that "one particular harbor" Jim and I came so quickly to love.